After Walter Kaufmann's study Nietzsche reintroduced (or introduced properly) the study of the German philosopher to the English-speaking world in 1950, his big collection The Portable Nietzsche appeared from the Viking Portable Library in 1954. Another omnibus collection, Basic Writings of Nietzsche followed in 1968. (Our reviews of the two collections complement each other and partially overlap.) Friedrich Nietzsche's ideas often are path-breaking, his language subtle, and his style scintillating — he is notoriously difficult to translate, but surely no less worthwhile for that. Walter Kaufmann is a native speaker of both German and English, with a flair for melding the translator's goals of accurate meaning and idiomatic readability, even with poetic flights when these are called for — Nietzsche being a poet as well as a master stylist in prose. Additionally, Kaufmann has done considerable other work with philosophy and religion, the history of ideas, and literary criticism from the classics to the moderns. Given the nature of languages no translation will be perfect, but Kaufmann's are the standard in English for Nietzsche's major works. Part of the delight in reading Kaufmann's translations lies in the footnotes where he points out some Nietzschean stylistic choices, wordplay, even puns, and makes these accessible to readers without German but with antennae for the structure of English words and phrases. Nietzsche is vastly easier to read than most of the leaden-pen claimants to philosophical writing, and Kaufmann's translations first brought this readability to English. It's important that the reader of Nietzsche in English be aware that translations before Kaufmann's run from not-so-good to downright awful; don't buy older editions with pre-1950 translations or cheap modern reprints of them. The Portable Nietzsche includes a little broad but educational humor in Kaufmann's counter-instances of truly bad older translator's choices for a few passages, particularly from Thus Spoke Zarathustra. Bad translations bedeviled and misled British and American readers of Nietzsche throughout the first half of the Twentieth Century. This illustrative handful of mal-translations, occasionally hilarious, by their bad example remind us of the virtue of reading closely, the rewards of taking our time, of suspecting subtleties and glancing around for connections, of enjoying Nietzsche's surface wordplay but sensing the depths of meaning. In about 700 pages, The Portable Nietzsche gives us a powerful balance of complete books, excerpts, and letters; with a brief but useful general introduction, item introductions, and a chronology. The four complete books are the famous Thus Spoke Zarathustra, the late, short, and very sharp Twilight of the Idols and The Antichrist, and Nietzsche Contra Wagner — the last of these being a brief compilation by Nietzsche himself. There are evocative excerpts, usually complete aphorisms, from ten other books; these books now can be found entire in good translations made since The Portable Nietzsche first appeared. Important shorter items excerpted are "Homer's Contest" and "On Truth and Lie in an Extra-Moral Sense". There are a handful of notes, some from the posthumous collection called The Will to Power, and a few letters. In his introduction to Thus Spoke Zarathustra, Kaufmann says a little about word coinages, in which Nietzsche excelled, and of course these often call for creative translation. This shower of fresh words is not the only resemblance we may find between Zarathustra and John Milton's Paradise Lost. After all has been said, Zarathustra still cries out to be blue-pencilled; and if it were more compact, it would be more lucid too. Even so, there are few works to match its wealth of ideas, the abundance of profound suggestions, the epigrams, the wit. What distinguishes Zarathustra is the profusion of "sapphires in the mud." But what the book loses artistically and philosophically by never having been critically edited by the author, it gains as a uniquely personal record. Those who browse in this volume will find a conglomeration, where anyone reading it straight through will likely find one of the most fascinating men of all time: a man as multi-dimensional as his style, profound and then again piteous, as tragic as he is widely supposed to have been, but no less comic — almost as different from his popular caricatures as a character in Shakespeare, or more likely in Dostoevski, is from the comic strip version of Superman. In his own formula: Ecce homo! 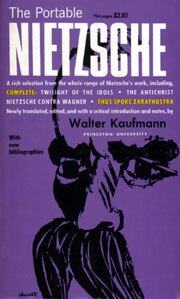 For further reading, Kaufmann's other major Nietzsche translations can be found in another superb omnibus collection, Basic Writings of Nietzsche; as well as the important individual volume, The Gay Science; and a posthumous collection of notes, The Will to Power (the latter with R. J. Hollingdale). Walter Kaufmann's respect for Nietzsche and his empathetic care with presenting his works in English shine through The Portable Nietzsche. It is unfortunate that America and Britain could not have had such a compendium fifty years earlier.